Spend a charming day wandering this pretty Provence port — and pick up a bottle of crème de cassis and marc while you’re at it. Built on a hillside, the 17-century medieval town of Cassis, in the South of France, is clustered around a harbor shaped like a crescent (or, one might say croissant). Many of the buildings have beautifully weathered shutters and the town’s warren of charming narrow streets are lined with cafés, restaurants, shops and residences easily accessible by foot, or à pied as the French say. After our afternoon excursion on the Mediterranean touring the white cliffsides known as calanques, the Shirl, Dave, Wally and I had worked up an appetite and decided to have lunch on the seaside terrace of the Marco Polo Restaurant. What appeared to be a regular diner was enjoying his meal near the entrance to the restaurant. When he finished, he lit a cigar. A waitress drizzled water across his lap and told him to put it out. When he refused, she threatened to pour a full glass over his head — and he finally acquiesced. Each of us ordered the Marco Polo salad. The mixed greens included shredded chicken, Granny Smith apple slices, Belgian endives, cherry tomatoes, kernels of corn and a light mustard dressing. We all enjoyed them — a nice light break from all the fromage and cured saucissons. Wally and I also ordered Kir Royales, champagne with the addition of the syrupy blackcurrant apéritif liqueur crème de cassis. As an interesting aside, the Provençal region is known for rosé and Sauvignon Blanc — not crème de cassis, which is a specialty of the Burgundy region. 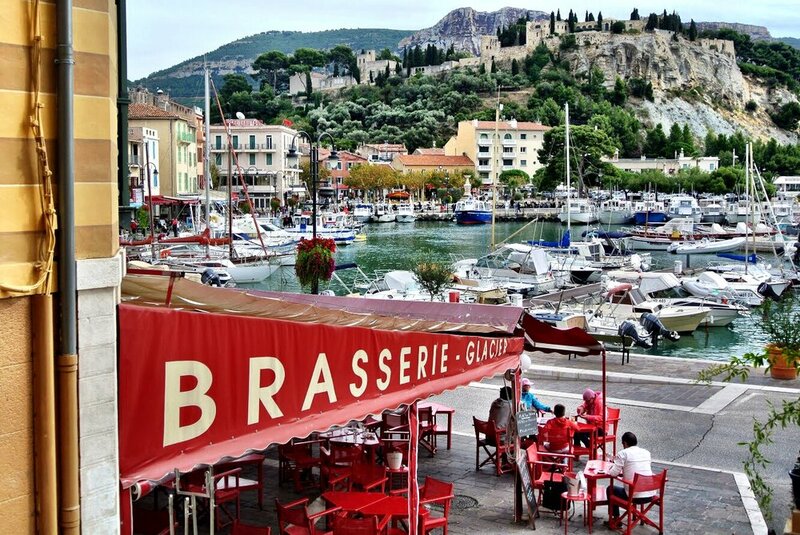 Should you decide to wander the streets of Cassis after lunch (and you really should), there are plenty of shops and boutiques to whet your appetite, offering local wares — but you may find many of them closed. Shops close up to three hours for lunch between 12 to 3 p.m. The streets are narrow, rounded and lined with brightly colored buildings — some of which are striped! One shop in particular that piqued our interest, the Cassis-Provence shop, allegedly resumed business at 2 p.m., but didn’t unlock its doors until 2:45 p.m. (We know cuz we kept checking back, we were so eager to get inside.) C’est la vie, as they say — life follows a different schedule in Provence and even more so in a seaside town. The shop proprietor was wearing a voluminous pink cotton candy cloud of a dress which made her look like doll, earning her Wally’s fitting nickname Madame Poupée. Older PostWhat is the Day of the Dead?